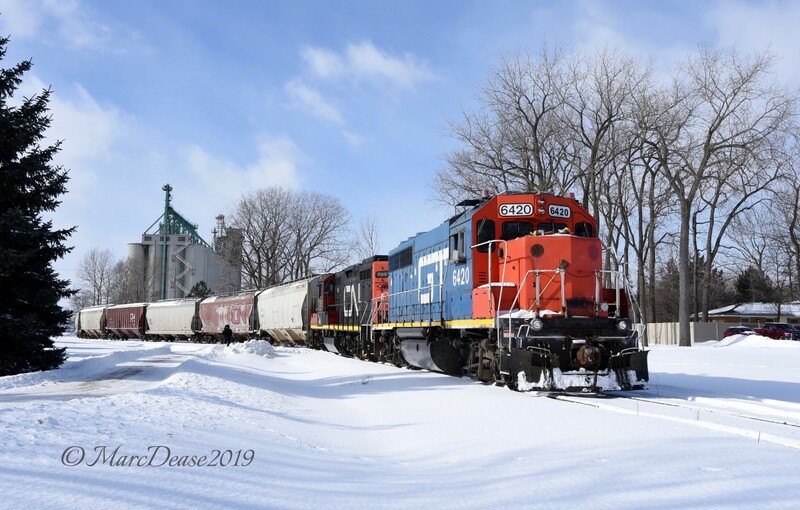 Railpictures.ca - Marc Dease Photo: GTW 6420 leads the IOX job after picking up a 2 dozen full hoppers at the elevator in Sarnia. They would drop these at Devine St., and return with a cut of empties. | Railpictures.ca – Canadian Railway Photography – photographie ferroviaire Canadienne. Caption: GTW 6420 leads the IOX job after picking up a 2 dozen full hoppers at the elevator in Sarnia. They would drop these at Devine St., and return with a cut of empties. Thanks Earl, can’t get enough of those GTW’s around here. Good stuff, Marc. Nice leader. Thanks Jason, that was one cold day that day. Really nice winter scene Marc.